Marvel on Tuesday held a special event to detail some upcoming projects, and there is a lot of stuff to go over. A lot. Couldn’t get enough of the Avengers 2 trailer that hit last week? Good, because you’re really in for a treat today. We thought DC responded quite well when it unveiled its upcoming movie road map, but this response from Marvel’s “Phase 3” is blowing anything and everything out of the water. This really is turning into the golden age of Hollywood comic movies. Following Avengers: Age of Ultron on May 1 of 2015 and Ant-Man on July 17, 2015, Marvel has its plans mapped out for many years to come. Moviegoers are sure going to be busy. Below is Marvel’s plans listed out. We’ll dive in a little deeper below. A lot of those movies should sound familiar to casual comic fans, and the majority of them are sequels or threequels, including Captain America, Thor, Guardians of the Galaxy and Avengers: Infinity War. But titles like Inhumans and Black Panther, which was perhaps hinted at in the Avengers 2 trailer, might be new to some folks. Inhumans follows a race of superhumans that exist in Marvel’s shared universe, and includes a number of members: Black Bolt, Medusa, Karnak, Gorgon, Lockjaw and many more. Marvel didn’t reveal which of the characters will appear in the film, or casting for that matter, but Marvel did say it wants Inhumans to be a franchise unto itself, which could hint at standalone films for characters appearing in the film down the road. Marvel said Chadwick Boseman, best known for his role in 42 as Jackie Robinson, will play Black Panther. 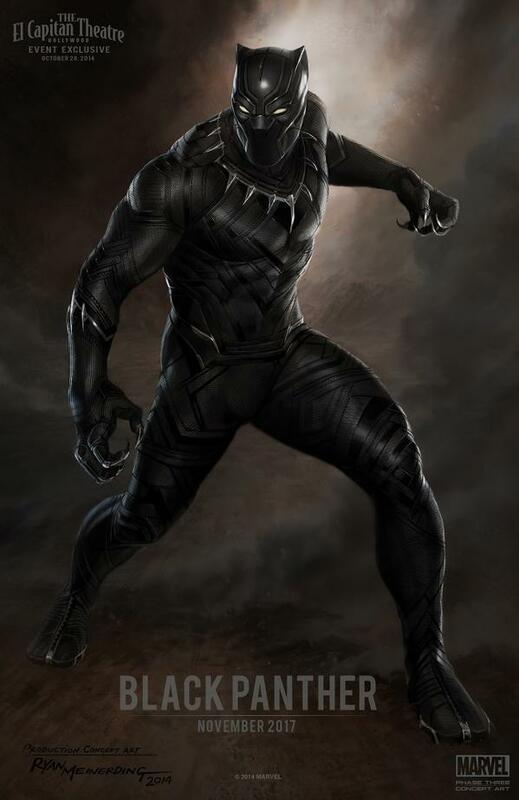 As we mentioned in our Avengers 2 writeup, Black Panther is otherwise known as T’Challa, and is from the fictional country of Wakanda; he later joins up with the Avengers, so I imagine he’ll feature in Avengers: Infinity War (Marvel said he’ll be introduced officially in Captain America: Civil War). His powers include superhuman senses and olympic-level strength, speed and agility. As far as Captain Marvel is concerned, Marvel said a director and other announcements will drop soon. Captain Marvel actually includes several different versions of characters, but Marvel confirmed it will center on Carol Danvers, who is also known as Ms. Marvel; she recently assumed the mantle as Captain Marvel (as of 2012, in fact). Carol Danvers appeared as Ms. Marvel as far back as 1968, and has powers similar to Captain America as a result of their DNA merging following an explosion. While there is no standalone Hulk film, Marvel did say that the character will feature in a lot of the movies announced today. Whether there will be a spot for another Hulk movie remains to be seen, but rest assured we’ll be seeing a lot more of him in the future, including the Avengers films. And like the rumors suggested, Captain America will face off against Iron Man in the Civil War storyline, which focuses on the U.S. government passing a Superhero Registration Act designed to essentially control superheroes. Captain America is opposed to it in the comics, while Iron Man supports it. Plenty to mull over right now, and a lot to look forward to. And what about Thor: Ragnarok? Well, see for yourself. It doesn’t end well, but Marvel could handle it a bit differently. I’m not so sure mainstream audiences want to see Thor die, and Chris Hemsworth subsequently not appear in Avengers 3. Between DC and Marvel, there are a ton of great new movies coming out over the next several years, and it all starts when Avengers 2 hits theaters early next year.